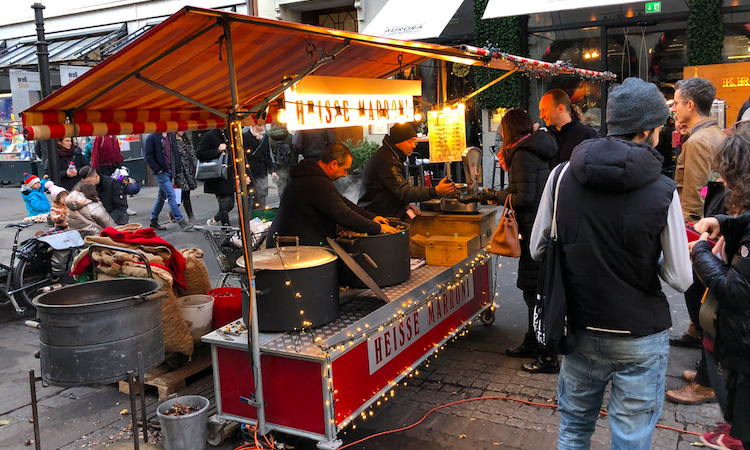 Chestnuts are not just the most popular winter street food in Switzerland. They are also low in fat and calories and high in dietary fiber, vitamins, and minerals. They have always been readily available. In mountainous terrain, it is far easier to grow Marroni than grain. Consequently, the ‘poor man’s bread’ can be found all over the country, especially in the cantons (or states) of Ticino, Jura, and Valais and around Lake Lucerne, Lake Geneva, and Lake Zug. They are healthy. Unlike other tree nuts, Marroni are largely made of starch, making them comparatively low in fat and calories. Additionally, they are an excellent source of dietary fiber, vitamins, and minerals. They go with anything. It may sound strange, but Marroni can actually be sweet or savory. Roasted, they taste earthy with a creamy texture. They are often caramelized and added to sauces and salads. Puréed, Marroni make delicious desserts and sweet bread spreads. Today, Marroni are considered a winter delicacy. And they are not cheap. The 250g packet in the picture cost me roughly 10 dollars. Of course, you can get them at the store and roast them yourself (in a pan). That slashes the price by more than half. 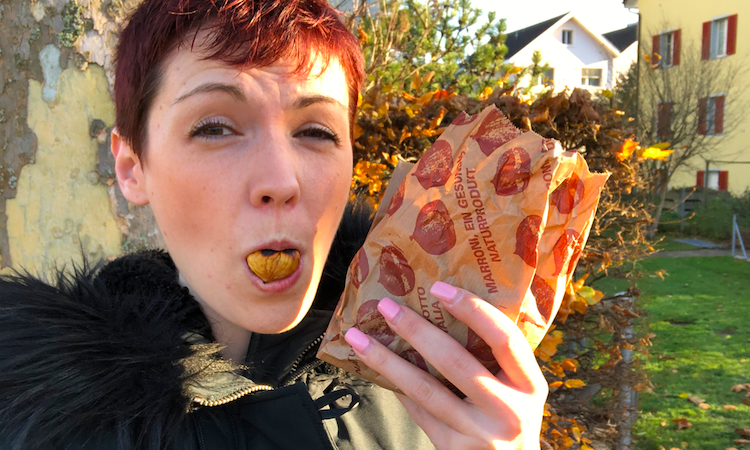 At the outdoor stands, what you’re really paying for is the luxury of a hot snack to warm your cold hands. Fun fact: the paper bags the Marroni come in have an extra pouch for the peels, making them a very practical treat to carry around as you shop, run errands, and go about your day. In the US, you may not be able to get Marroni on every corner. But you can definitely pick up some roasted chestnuts at Walmart and recreate some of the most popular Swiss Marroni dishes at home. 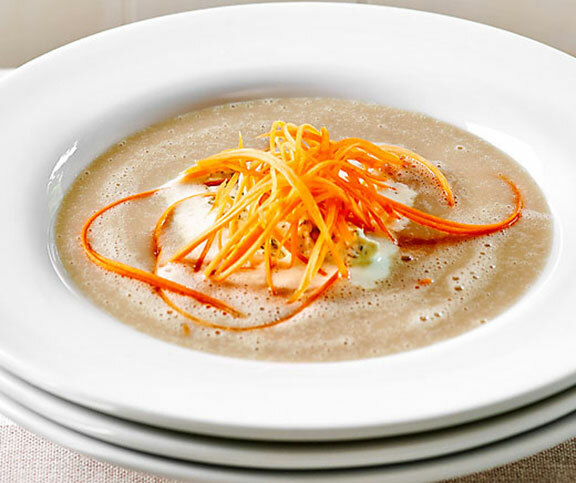 How does a spicy-sweet Marroni soup sound? Surprise your family and friends with this easy-to-make, mouth-watering Marroni soup. In a large pan, sauté shallots and chestnuts in butter. Add sugar once shallots become translucent. Add bouillon and bring to a boil, then reduce heat, cover, and let simmer for about 20 minutes. Add half of the cream, purée soup with a stick blender, salt and pepper to taste. Beat the rest of the cream, add the parsley and a pinch of cayenne pepper, pour on top of the soup, garnish with carrot strips. As you may know, Switzerland is divided into four linguistic regions. Therefore, I wish you: En Guete (Swiss German)! Bon appétit (French)! Buon appetito (Italian)! Bumperfatscha (Romansh)!